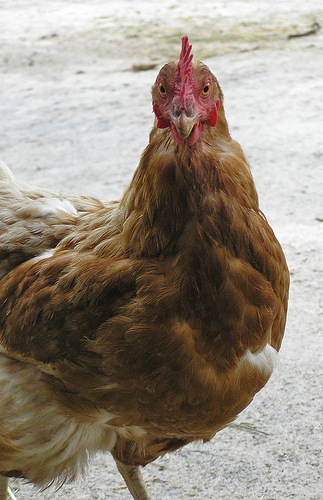 It’s illegal to raise chickens within the city of Alexandria. Yet, there they are, a beautifully colored flock of birds, maybe a dozen in all, living large in the city limits. They make me smile every time I see them. For contraband, they’re brazen – they’ve been pecking away alongside a well-traveled four-lane street for several years. Flouting the law, they strut about a grassy hillside and circular driveway. I’m sure they make their owners very happy with a bounty of fresh eggs. When the craze for free-range chickens hit Washington a few decades ago, CRR and I chuckled. We grew up around chickens, and so we knew exactly what free-range birds eat: anything, from small pebbles to bits of grain pecked from the barnyard poop of other animals. Maybe they are happier, as depicted in the TV show “Portlandia.” When free-range eggs first showed up at our farmers market several years ago, I gaped at the price: $3 a dozen, when the supermarket variety was still going for $1. I asked the farmer if he could sell the eggs at that price, and he said he couldn’t keep up with demand. And, yes, I will allow that a farm-fresh egg is tastier, as Flavor magazine has written. But I’m still not contemplating turning out chickens in our own backyard, though we have room and clearly Alexandria law enforcement is willing to look the other way. I’m content to crane my neck to spot the city chicks once or twice a week, strutting beside one of Old Town’s elegant old avenues. In the back of my mind is the idea that Alexandria ordinance says chickens must be kept 300 feet from nearest property line. Those chickens on King St. may qualify, regardless of where they wander.